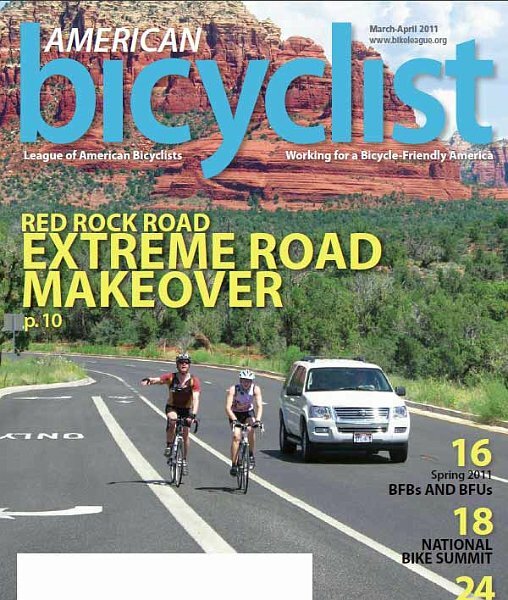 This article originally appeared as the cover story of the Mar/Apr 2011 issue of American Bicyclist magazine [full issue; see cover, story starts on p.11]. A certain well-known television show begins with a deserving family in need of a new home. Designers get to know the family’s needs, wishes and desires, and then a village comes together to demolish their dysfunctional house and reconstruct a home that exceeds their expectations. 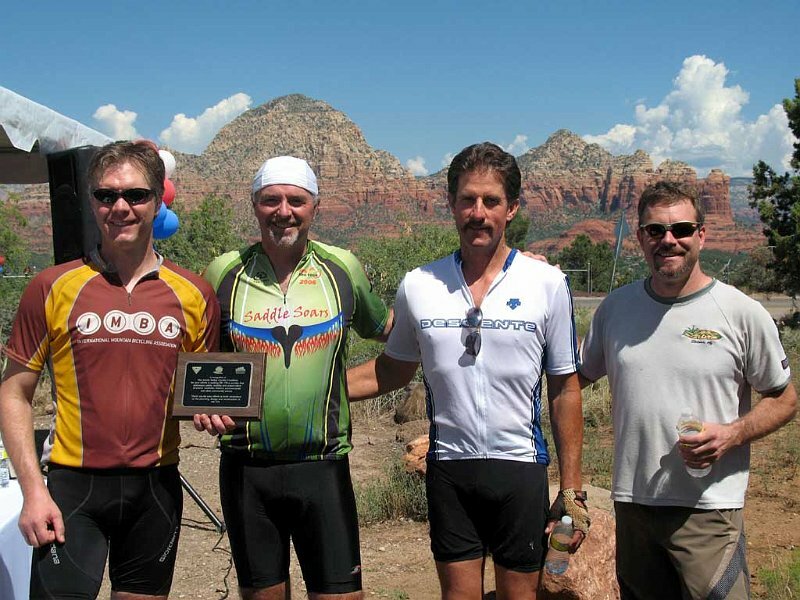 bicyclists from the area and around Arizona rode the highway, joined in celebrating the completion of the Red Rock Road and heard Sedona Mayor Rob Adams declare his intention for Sedona to achieve LAB Bicycle Friendly Community status. As a matter of geography, Sedona and the Village of Oak Creek are nestled near the banks of Oak Creek in the Verde Valley of north central Arizona, about two hours north of Phoenix. Both communities are surrounded by stunning red and white sandstone cliffs and slick rock, making the area a much visited destination for tourists, photographers, hikers and mountain bikers. For years, the Arizona Department of Transportation (ADOT) had known that something needed to be done about Highway 179. It was an up-and-down two-lane road, with no shoulder, blind corners and which couldn’t handle the load of weekend/holiday traffic without bumper-to-bumper back-ups for miles. Bicycling on the road was out of the question for most commuting and recreational cyclists. Nearly a decade ago there was reportedly a conclusion made at ADOT that Highway 179 should be reconstructed as a four-lane highway, more akin to the limited-access interstate highway system profile. Once the word got out in the Sedona/VOC area, there was uproar. To ADOT’s credit, they listened to their constituents, and began the first “Context Sensitive Solution” roadway project in Arizona history. A process was begun to solve the traffic problems in a way that met the other needs, wishes and desires of local residents. Local cyclist Ian Wickson almost singlehandedly drafted an influential proposal for bicycle accommodation which is still viewed as a model document by some ADOT planners and project managers. Governmental bodies/agencies involved were Yavapai and Coconino Counties, City of Sedona, Big Park Regional Coordinating Council, Coconino National Forest, the Federal Highway Administration and ADOT. Input was received from numerous individuals, as well as the Verde Valley Cyclists Coalition. Echoing Victory’s sentiments, current VVCC president, Daniel Paduchowski said at the roadway completion festivities, “The story goes back about seven years when concerned cyclists from the entire Verde Valley met with ADOT in the parking lot of Absolute Bikes and let them know that bicyclists were there and wanted to be heard.” Had advocate Randy Victory not organized that demonstration in 2003 there probably would not have been any bike lanes or other accommodating features in the project. The VVCC got a seat at the table, involved themselves in local politics and planning and gained the support of mayors, city councils, public works directors, local newspapers, and the strong support of Yavapai County Supervisor Chip Davis and Coconino County Supervisor Matt Ryan. The consensus of the community was that the project needed to improve traffic flow while staying respectful to the environment, neighborhoods and communities through which it flowed. It also needed to create a multi-modal corridor that accommodated not only automobiles, but pedestrians/hikers, bicyclists and bus/trolley use. With this charter, ADOT’s supportive and talented project team went to work on design features and options for this high-profile project. But, community consensus was not all it took. Sedona and VOC had no street sweeping equipment. ADOT management would not agree to stripe bike lanes unless quarterly sweeping was funded for at least three years. Neither the State nor the County would provide that funding. So, Paduchowski passed the bicycle helmet and secured pledges from Paul Dominique at the Verde Valley School, Jim Monahan of Bike & Bean, Ken Lane and Steve McClain of Absolute Bikes, and Mike Wise and Mark Keickis of Commerce 89. With those and other pledges in hand, the Sedona Community Foundation granted the VVCC matching funds to meet ADOT’s requirement. This was the first arrangement of its kind in Arizona, allowing a non-profit advocacy organization to sign an agreement with ADOT to secure dedicated bike lanes. Bike lanes and debris space to the right, but with curbed areas to discourage vehicles from pulling over unless due to an emergency (random photo stops at road side were a frequent feature of this highway). Wide center/median left-hand turn lanes to help keep main lanes moving forward without vehicle incursion into bike lanes. Roundabouts (traffic circles) with 15 mph speed limits have replaced all stoplights and allow bicyclists to merge with traffic, take the lane and proceed through intersections in the normal flow of traffic. Scenic overlook parking areas, providing an alternative to stopping on the main road for motorists and tour buses. Connectivity between Sedona and VOC, the neighborhoods in between and the various shops, restaurants, businesses and trailheads along the route. Recreational road cyclists, mountain bikers, commuting and touring bicyclists all will benefit from these significant improvements in access and safety. For portions of the route, there is also a sidewalk/path suitable for families with smaller children. With time, the full impact of this project will become clear. 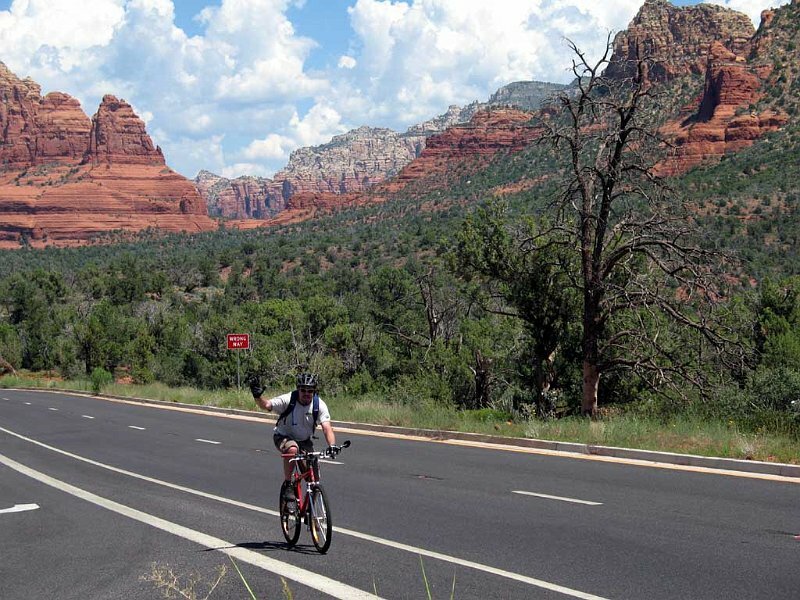 But, local bicycle shops already have added road bikes to their rental fleets and ADOT plans to add bike lanes next year on Hwy 89A in the western part of Sedona to connect bicycle accommodation from the Village of Oak Creek all the way to Cottonwood, over 30 miles away. The VVCC and the Coalition of Arizona Bicyclists are planning bicycling events, an economic impact study and video to showcase what has been achieved, and what is yet to come. Sometimes it takes a village…or, in this case, maybe a village, a city and a Valley…and a handful of persistent advocates who fought the good fight and made a bit of bicycling advocacy history in Arizona.